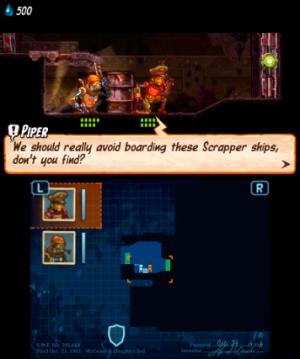 When a studio has a surprise hit such as SteamWorld Dig, it would likely be forgiven if a straightforward sequel rapidly followed. That doesn't seem to be the norm on the eShop, however, and Image & Form has produced an ambitious follow-up in the form of a turn-based strategy game with a twist, placing trick shots and shooting accuracy front and centre. Though SteamWorld Heist buries itself in more complexity than its predecessor, carefully crafted systems and the charms of the IP combine for another excellent portable experience. Arriving on the 3DS first, in honour of the importance of the system in Dig's breakthrough, Heist is an excellent fit for the platform. Many 3DS owners will be familiar with turn-based strategic gameplay, meaning that even with its own approach to the genre Heist feels at home on the portable. 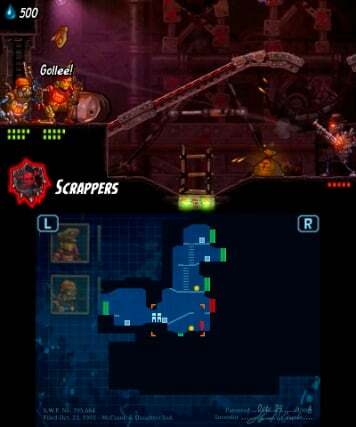 The core gameplay loop involves a team of steambots, from solo battlers to teams of four, taking on a host of stages that each form varying challenges. 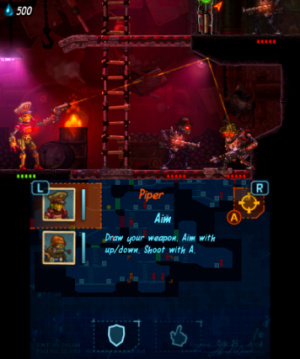 The perspective is locked on a 2D side-on angle, with caters to the skill-based combat system at play; though much of the usual strategy ideas are here, such as managing a team and positioning your crew carefully, the manual attacks serve to add a new layer of pressure to proceedings. As a system it's certainly fresh, and undoubtedly addictive. At times we've set up the scenario well only to make a bad mistake and miss with an easy shot, while some of our most memorable moments have been pulling off unlikely distance or trick shots when our backs were to the wall. As a result it's a smart gameplay mechanic - though statistics such as your attack power, enemy health and so on still matter, a moment of outrageous skill can tilt a battle at a critical point. It's effective at adding tension to the scenario and, in a particularly deadly way, enforcing a 'one-more-go' mentality that can see multiple hours pass by in a single sitting. Combined with carefully crafted balancing, which we'll address more further on, this system works wonderfully. After a brief tutorial it feels natural to move with the D-Pad, either a little to then complete an action or shoot, or perhaps to 'sprint' further and sacrifice a shot or item use. Taking cover is also integral, while explosive barrels and more complex environmental aspects later in the game give more to ponder. On the one hand all of these factors combine to deliver a fairly substantial set of mechanics, and on the other it's very simple and easy to understand when actually playing. 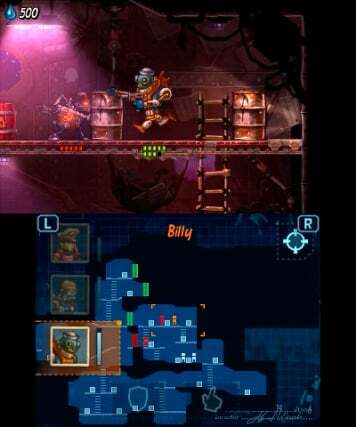 One point we've noticed in general play, however, is that the visible real estate on screen is relatively limited - which will likely broaden and zoom out in the HD Wii U version, as happened with SteamWorld Dig. This can be worked around with Circle Pad camera movement, meaning the occasional need for 'longshots' where you cross your fingers and hope for the best. Our only minor criticism of the overall combat system, meanwhile, is that learning enemy unit move distances is trial and error; you can't select an enemy, for example, and assess their movement and attack range. Fairly aggressive tactics can overcome this, while adopting cover and strategically utilising solid walls and floors - rather than those that can be shot through - provide the means to ultimately plan for the enemy's attack. Your robots and the varied enemy bots you face all fit into loose classes and types. On a basic level this affects the kinds of guns they can operate, from pistols to grenade launchers, shotguns to long distance sniper-style attacks; you start off with just two crew members and recruit more on a fairly linear basis. The pacing is excellent, in that you generally get introduced to new compatriots once you've begun to master the existing team, which helps to maintain a sense of momentum to the campaign. Beyond basic weapons each has their own special moves and buffs to offer, which later in the game allowed us to settle on a core team that matched our preferred style. Completing levels shares experience points among the bots you took on the heist, and the volume of XP varies depending on performance. Each stage has three stars to earn - two for objectives and one for picking up the 'epic swag' item - while each lost crew member deducts a star. Any robots shot to pieces in battle do return on your hub ship, but the lost character does lose its share of earned experience points. Gaining experience is truly vital, too. Levelling up a character unlocks a mix of improved stats such as health or, more usefully, new abilities. Varying your crews early on to see how each character levels up is a key tactic, and also fun, and as you approach the close of the campaign your strategies will be unrecognisable from the start. Perhaps you'll be utilising movement to flank enemies more, trying to gamble and initiate powerful melee attacks, or seeking all-rounders that can survive the toughest encounters. All of these strategies matter, especially as enemies become more diverse and tricky to handle, while Boss encounters are also particularly challenging. These take a lot of hits to put down and are most likely to necessitate level restarts, especially in the closing third of the story. Some bosses are brutes that simply chase you down for powerful melee strikes, while a particularly memorable foe pulls off outrageous ricochet shots. If the going gets too tough you can alternate between five difficulty settings at will when you start each mission. This is particularly handy in terms of strategy or if you're stuck and simply want to make some progress. In the easiest difficulties there are no extras or penalties, but once you opt for the third setting and up you gain more experience points for successes and, crucially, failed missions will take a percentage of your overall pot of money. That's some serious risk-reward, especially if you've saved money up for a particular item; when we had a pot of cash saved up we occasionally backed down a difficulty level, though some players will undoubtedly be braver. Overall the structure of the gameplay, with the combination of 2D turn-based strategy with manual attacks, works wonderfully. It's a hook that works so well courtesy of the diversity of guns and attack types, and in addition there are lots of inventory items to acquire or buy. The constant looting of ships when completing missions keeps you in the money and swapping out items, with limited inventory space emphasizing prioritisation. There's a nice balance of depth and simplicity; there's plenty to consider, but it's managed and limited to ensure you're not overwhelmed. Contributing to all of these mechanics, thankfully, is a similar degree of design charm as was so vital in SteamWorld Dig. The setting of robot clans traversing space sets up some humorous narrative points, from the questionable motives of the Scrappers, to pompous and dangerous Royalists and more besides. The cast of playable characters, enemies and NPCs that populate the bars and shops is quirky and diverse, with some fun writing bringing them to life. There's also the silly meta game where you can shoot the hats off enemies' heads during battle, if you're feeling bold and want to shake up your collection. Utterly silly yet, at the same time, impossible to ignore when you want your crew to look that bit more stylish. 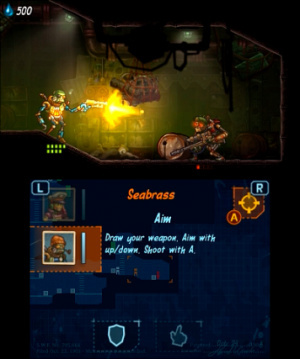 Strong presentation values are at the heart of SteamWorld Heist, too. Visually it does a fantastic job with the steampunk aesthetic, at times portraying grubby and clunky metal and at other points showing a little more splendour or surreal design. The image also has an extra sharpness and clarity, to our eye, once the 3D effect is enabled; it's a subtle effect but adds some welcome pop. There are stylish cinematics too, mimicking old-school information broadcasts that bring to mind 1930s UK cinema reels, right down to the dramatic orchestrated music. A mention should also go to the soundtrack. General stages have pleasant, atmospheric music that does its job well, but a favourite touch of ours are the tracks by real-world band Steam Powered Giraffe, who appear in-game as bar performers. Combined with the strong sense of style and technical accomplishment of the visuals, the soundtrack contributes in a notable way to the overall vibe when playing. A final point to address is the game length, naturally. With a higher price than its predecessor the focus is not only on the different gameplay style, but how much value it offers. The core campaign is rather lengthy, thankfully; we blasted through it in about 13 hours, albeit while dropping the difficulty on multiple occasions to smooth out our progress and skipping a couple of optional 'Challenge' stages. Most players will likely add a couple of hours to a normal first playthrough, and there is a neat - albeit modest - twist in a New Game+ option. We're certainly keen to play through again using this + mode while shooting for full completion, but even for those that don't have the same urge it's a meaty story on offer. SteamWorld Heist is an entirely different proposition to its predecessor, and that's no bad thing. Its quirky blend of a 2D perspective, allied with turn-based strategy and skill-based attacks, is a surprisingly addictive combination. There's impressive depth to the overall mechanics, and it's all topped off with a level of presentation that's both charming and accomplished. Whether seeking challenging strategy or an entertaining story, this title delivers both in its own unique way and has certainly stolen plenty of our time; we haven't even got all the hats yet. Must-have for me this month. I'm curious about how much it will cost in Brazil. @rushiosan fun game! Got some footage up on YouTube. You can make some awesome head shots! I might pick it up! Image & Form knock it out of the park again. I have both Steamworld Dig and Tower Defense, will certainly pick this one up as well. I've had an "ambassador" advance copy for a few days after winning one of the Image & Form contests, so I've been lucky enough to try it out already — I had already started writing a review, and mine is shockingly similar to what @ThomasBW84 wrote here. This is a good thing! It's a really fantastic game, and I would say in some ways better than the outstanding SteamWorld Dig. The most important take-away I can offer is this: even though I LOVED Dig, I was a little nervous about this game because I am not a huge fan of turn-based strategy games, and I just didn't know what to expect after watching the trailers. Any fears I had were immediately overcome by the quick but gentle tutorial, and not only did I get the hang of it quickly, I started coming up with better strategies and a more aggressive style. And I am no completionist, but I find myself going back and re-playing levels in which I didn't get the max number of stars, to improve on my previous strategy — no easy task when the levels are procedurally generated and therefore a bit different each time! In other words, as with SteamWorld Dig, I am hooked on SteamWorld Heist. One last thought - I know for many regular commenters, value / pricing is a concern — there was a lot of consternation around here when the excellent Steel Empire listed for about $30 US. I can assure you, SteamWorld Heist is every bit worth the "premium" full price, and is a steal at its current introductory discount. Pardon the cliche, but if you buy only one eShop game this Christmas, make it SteamWorld Heist. Trust me!!! @abe_hikura my thoughts exactly. I wonder if they'll offer a discount, or a free download code to those who have the game on the 3DS. Super excited for this, although it'll be a while before I get it because of Xenoblade Chronicles X's massive girth. Been looking forward to this for so long now. It's great to see it reviewing well but I'm not really surprised. ❤️ Image and Form. I'll wait for the Wii U HD version. Good! Now I just have to wait for the Wii U version: Dig was great in HD and devs used the gamepad wisely. "When a studio has a surprise hit such as SteamWorld Dig, it would likely be forgiven if a straightforward sequel rapidly followed. That doesn't seem to be the norm on the eShop," love this. The way in which digital distribution and self publishing has empowered people that love games - first, foremost and often seemingly even more than profit - has been one of the most important and enriching things to ever happen to the industry we love, as far as I'm concerned. Is there a release date for the Wii U yet? Will be picking this up. Can't wait to play this tomorrow! These reviews just confirmed what I already knew and that it would be great. @JJtheTexan Thanks for the thoughts on the game! I absolutely loved Dig, but I am NOT a strategy guy at all. I was gonna pick up the game anyway to support Image & Form (and to give it a chance, of course!) because Dig was so good and the I&F team is so likable, but what you said makes me feel much better about getting it. I really do think I'll like it-it looks great! @Spoony_Tech Could not agree more mate. It looks amazing, and from the review, it sounds like it plays just as well. Will this only be for download, or eventually would their be a physical release? 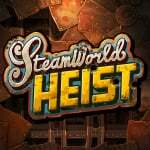 @JJtheTexan "but if you buy only one eShop game this Christmas, make it SteamWorld Heist. Trust me!!!" Thanks to one of the more congenial commenters on NL I find myself in possession of 1 of the ambassador codes so look forward to giving this a try. Apologies to anyone expecting a rant about the price from me. Great! I was sold on this game from the E3 trailer. Enjoyed dig a lot and it's great to see a game company develop its own universe to use as a backdrop for different creative ideas. However, not being able to forecast enemy moves and attacks has me worried a little. It's usually a very helpful tool in these strategy, turn-based games, but I'm sure I will enjoy nonetheless. @JJtheTexan - I have to agree with your thoughts. This game is very worthy of the 9 it got and for the opening discount and free 3DS theme, I would recommend a purchase to anyone who enjoyed SteamWorld Dig, or anyone who likes turn based games. Image & Form has created an amazing game that could easily be a $29.99 3DS retail release. I can't wait to play this on my Wii U and relive the adventure on the big screen! "... Image & Form has created an amazing game that could easily be a $29.99 3DS retail release." A $30 retail release is worth maybe $10 as a digital only release, because once digital it can't be loaned, traded, sold. The idea of "buying" digital is a farce, because you don't own anything except a limited license to use the software. If the game was available retail at a higher price point, I'd happily buy it that way. Of course, that's unlikely to be a real possibility for such a small developer. I'm sure the game is excellent and worth buying. But $20+ CAD for digital content is a very hard sell for me. Others won't have that barrier - thank goodness, because Image & Form deserve to see success when they release great games. Downloading tomorrow, can't wait! All else can wait... Well, except Fast... Damn tomorrow is gonna be a good day! I've been waiting for this game since I heard it was a strategy game (I bought the first one but haven't had a chance to play it quite yet). Glad to hear that it is a great game and I will buy this day one. Looking forward to playing this over Christmas break. I'll wait for the Wii U version, but this is a must buy. I loved SteamWorld Dig. I can't wait to get my hands on this. I will likely double dip as I did with Dig once it hits Wii U. I love these developers. I'll buy it tomorrow but I'm currently playing so many games that I'll wait until I've finished Code Name STEAM before starting Heist. It shouldn't take more than a week. Oh man. Someone else who has played Code Name Steam! Nice to meet you! I loved that game, even if it wasn't perfect. What do you think of it so far? An utter shame that the sales of that game are simply non-existent. @Smoo I'll get the Wii U version too. By the way it's great to see other Diddy Kong Racing fans - absolutely love that game. @MoonKnight7: I got it when it was on sale a couple weeks ago and so far I enjoy it very much. I've played in small burst due to having so little time to play. I just finished a mission where there are two alien queens that you have to defeat by climbing up to them while they spawn more enemies. I was interested in it way back when it was announced and played the demo but I wasn't sure if it was worth the full price so I waited for a sale. Looks like Intelligent Systems can't disappoint when it comes to strategy games (they have barely made any bad games in general). It's not quite as good as Advance Wars and Fire Emblem but it's still great and plays quite differently compared to the other two. I love the comic book style. I could pretty much copy my thoughts on Fast Racing Neo and paste them here. It looks good, but nothing I've seen of it suggests it's a 9. I might love it if I play it, but I'll need to try it out before I buy it. I bought steam too, but I really don't like it. The marvel esque plot and characters leave me cold. Bought it thinking intelligent systems could do no wrong. Thanks for making polished, fun gaming. I was excited for this title from the moment i first heard of it and after finding out Steam Power Giraffe was working on the soundtrack it was like icing on cake good to hear it is worth the wait day one purchase for me . Splendid review. My New 3DS gets the best treat a handheld console could get.. Turn based strategy gaming! Can't wait. Awesome, I hope you continue to enjoy it. It was one of my favorite games this year, even with its imperfections. I just loved the campy Saturday morning cartoon charm. Abe Lincoln, leading a bunch of fictional characters to combat aliens? Sign me up! That's so zany and campy, I love it. Sometimes the game gets punishing, but it wasn't enough to put me off. That's too bad, I'm sorry to hear that. I loved the Saturday morning cartoon feel it had, but to each their own. I can understand the complaint. Its a moot point honestly, we won't be seeing a sequel for it. So you can shoot people's hats off if you want to wear them, "wasting" a turn, but you don't get the hat if you just destroy them? That's amazing!!! I guess they will do a similar excellent job with Wii U HD version as they did with Steamworld Dig. I will absolutely get that version. The game is really fun, it's pretty challenging at experienced since you'll get penalized for having any casualties but you'll get more experience in the process. I don't remember the last time I had to manage my resources carefully except for maybe Fire Emblem as I had many times where I'd be choosing whether I'd want to sell some weapons or some of my gear to have room for better weapons/gear from the loot you find in missions. Oh no I can only buy one eshop title! Fast racing neo or this Aargh! What's block size on this? Loved Dig on Wii U, looking forward to this when it comes to my favourite home console! @imageform will there be a demo for this? As a fellow swede and also a fan of sw Dig i really want this but its not pay weak. Its a mental clash of wantings and wisdom to wait until payday or just buy it and eat noodles xD. I'll get this once it hits the Wii U eShop. @MattEriks Noodles all the way. Looks great but I will wait for the Wii U version. When I looked this morning it said £14.99 in the UK. Is this the correct price or will it have changed when I look again tonight. This is a good week for me as there are quite a few things I am looking to purchase and this is at the top of my list. I enjoyed the first game on multiple platforms so I have been looking forward to this since I heard about it. Pretty good reviews for this wherever I have looked. @Late @MoonKnight7 Other people who liked Code Name S.T.E.A.M?!?!?! It was my favorite game this past year and one of the few games I've come close to 100%'ing in the last 5 years. So sad the way it got shredded in reviews for not having an overhead map. There is a ton of depth, stealth and strategy in that game. I actually think the 3DS is the version to go with this game same as with Dig, it feels like a rich portable game to me. And i Love the new 3ds effect! Looks like the price is £14.99 (inc VAT) here in the UK not £11.99 as shown here in the review. @Brumblescope Yeah it's pretty sad.. I actually liked not having a map, it makes you more careful and considerate of your surroundings. I can't say it is one of my favourite games but I definitely enjoyed it. I would have loved to see a sequel but I guess that's not gonna happen..
Great review by the way, can't wait to play it ! @imageform When will it come out for the Wii U? Does the second screen add much to the game please? @donkeymonkey It adds a little, I think they make good use of it. The 3d is really good though. I feel like the second screen is always nice to get a lot of the display info off of the main screen... better immersion and plus it just annoys me to have it in the way of the action. Also, it probably makes the controls easy to learn since that sort of info can be displayed there and you can just tap the desired touch-screen button if desired. Lastly, it always nice for a game like this to have a constant map to look at without breaking away from the game. I went ahead and purchased the game tonight and played the first few levels... it's even more fun than I hoped and not as complicated/frustrating as I feared. Calling it a "turn based strategy game" might turn some people off (like myself at first)... I feel like it is very action oriented... kind of like a mix of the best parts of Angry Birds and Worms, with some Peggle elements... and a really cool art design. This has some rather frustrating mechanics that, had I known about, would have kept me from purchasing. Ugh. Naturally they'll never come up in any review. What a waste of money. @holygeez03 @MisterMan Thanks for your help guys! I was very concerned after watching previews that the game would be frustrating and annoying since I have never been into any turn-based strategies before. Since this game is nothing like anything I have played before, the mechanics were very foreign to me as well... but after just a few levels, I'm starting to get the hang of it. What are you struggling with and how much have you played? Did you try starting with the easy mode? The best attempt at help I can give is that each character has "two actions per turn"... you can move anywhere within the character's "orange range" and then perform a shooting action (R Button) to finish the turn... or you can "sprint" further into the "blue range", but you give up your second action for that turn by moving further. Other than that... it's a strategy game, so there will be a learning curve. Haha! Small world! Yes, I agree. I loved the game. I loved the nuts storyline, cause it was so campy and fun. It's a shame that the good to mediocre reviews largely stemmed from waiting for enemies to move. It's also a shame that the patch that released to help that with that didn't get as much coverage. As far as the overhead map is concerned. I liked not having one. It really made you think about your surroundings, almost like actually being there in person. There was real consequences if you wondered too far into enemy territory, and I think that was the point of not having one. Its a great game, and i wish more people would have given it a try. I do partially blame Nintendo too. It was largely overshadowed by Monster Hunter and Majora's Mask, which were heavily promoted with the new 3DS launch in the states. To give it a fair shake, Nintendo should have let it release along side those, or pushed back Majora's Mask to March instead. The c-stick was incredibly useful in STEAM, and would have fit the parameters of launching with the new system. Anyway, its in the past, at least we have a great game out of all this. @MoonKnight7 @tealicious Yeah. Storyline and characters are great. And the ridiculous theme song on the start screen. Love it. It was crazy how exaggerated the enemy turn length was as well. I read one website say enemy turns took 5-10 minutes! (I never had one last anywhere close to 5, let alone 10 minutes.) I am glad we got the game and you have some good points about how Nintendo could have marketed it better, I just hope they haven't given up on the franchise. I would love a sequel! @imageform Are you planning on releasing dlc or any major updates? If so I would love to see a multiplayer mode. Just saying. Also this game is fantastic and I've been playing it for 12 hours straight now! @ejamer "A $30 retail release is worth maybe $10 as a digital only release, because once digital it can't be loaned, traded, sold. The idea of "buying" digital is a farce, because you don't own anything except a limited license to use the software." @luke88 That's a shame. If it's such a good game and they're so confident about it there should be a demo, regardless. Especially when they're wanting that much for a digital only release. Just my opinion. And Multiplayer should be in WiiU, Cross platform multiplayer! But have WiiU exclusive weapons. This is a great game once you get into it but you have to give it a chance. Build up a team and by around the 10th or 12th level it starts to click. Pretty hooked on it now, great personality and deep mechanics. To anyone on the fence about this game, it's incredible. I will say that I do wish there were more opportunities to get spare boxes (room for inventory), but aside from that, I can't put it down. Collecting hats is incredibly addicting and silly fun (just like streetpass). I know this will be a game I revisit even after I finish it. You did good I&F, you did good! They have become one of my favorite indie developers. I can't wait to see what's next. One thing annoys me, when you pick a level or shop you can't just run back to it you have to re select it again on the map.